Ukrainian Central Committee [Український центральний комітет; Ukrainskyi tsentralnyi komitet, or УЦК; UTsK]. The only officially sanctioned Ukrainian political and community organization in the Generalgouvernement (1939–45). Headed by Volodymyr Kubijovyč, the UTsK oversaw virtually all secular Ukrainian activities following the closure of all other Ukrainian institutions in the Generalgouvernement. It also acted as a representative body that brought Ukrainian concerns to the attention of the German authorities. Its activities and structure were shaped by the occupation policies and the nature of the Nazi regime. History. Shortly after the fall of Poland local Ukrainian committees sprang up in the Generalgouvernement to organize cultural-educational activities, manage economic affairs, and provide Ukrainians with representation before the German authorities. In November 1939 the idea of a central Ukrainian organization was put forward at a congress of local committee deputies in Cracow. Roman Sushko, the chief representative of the Organization of Ukrainian Nationalists (OUN) in the Generalgouvernement, set out the legal and organizational basis for such a central organization, and a conference in late November established the Ukrainian National Alliance (UNO) as the central body. Sushko nominated Volodymyr Kubijovyč to be its leader; the other members of the executive included Osyp Boidunyk, Mykhailo Khronoviat, Ivan Zilynsky, and Yaroslav Rak. The new organization was tolerated, but not officially recognized, by the German authorities. Early in its existence the central organization developed a close working relationship with the Ukrainske Vydavnytstvo (Cracow) (UV) publishing house, the only legally sanctioned Ukrainian press in the Generalgouvernement. It used the publisher to print Ukrainian textbooks, and the UV's Krakivs’ki visti served as the unofficial organ of the UTsK. The formal organizational structure of the UTsK began to take shape after a meeting of Ukrainian representatives in April 1940. The numerous local groups functioning under its umbrella were reconstituted as Ukrainian relief committees (Ukrainski dopomohovi komitety, or UDKs) in order to expedite official German recognition. The UTsK itself was formally constituted in June 1940 as the official umbrella body of the UDKs and as such received official sanction. It incorporated other Ukrainian organizations under its name in order to provide them with a measure of legal status. This arrangement later developed into a system of subsidiary labor alliances that were linked to the various departments of the UTsK. It also established the Ukrainian educational societies (Ukrainski osvitni tovarystva, or UOTs) as affiliated groups. They were granted official recognition in July 1940. The UTsK executive was headed by Volodymyr Kubijovyč, with Vasyl Hlibovytsky as deputy leader and executive officer. 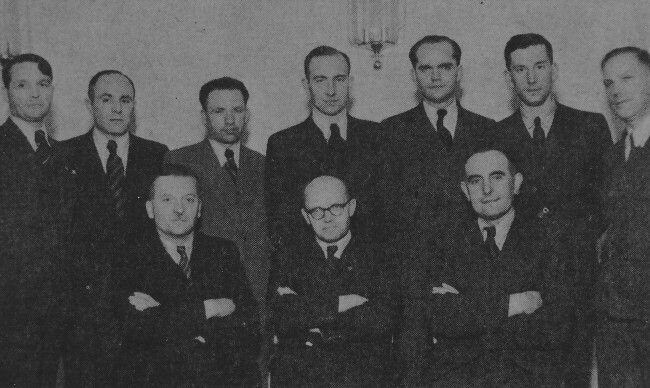 The UTsK departments and their heads consisted of the following: administration, Osyp Boidunyk, Mykola Tsenko (from 1941), and Atanas Figol (from 1943); finance, Oleksander Zybenko, R. Mytsyk, and Omelian Tarnavsky (from 1942); social services, Oleksander Malynovsky and Rev M. Sopuliak (from late 1941); culture, Mykola Duzhy and Mykhailo Kushnir; education, Nykyfor Hirniak, Ivan Teslia, and Petro Isaiv; economic affairs, Mykhailo Khronoviat, Atanas Milianych, and O. Kotyk-Stepanovych; and youth, Yaroslav Rak, Yuliian Tatomyr, Severyn Levytsky, and Zenon Zeleny. The UTsK staff numbered 80 to 200 people in 1940–5. In the spring of 1941 it dealt with 26 Ukrainian relief committees, 33 rural-district delegations, and 100 local trustees. The UTsK also established a mission in Berlin (staffed initially by Figol and then by O. Kotyk-Stepanovych) in the spring of 1941. Offices were also opened in Vienna and, briefly, Bratislava in 1944 during the evacuation before the oncoming Soviet Army. The Organization of Ukrainian Nationalists maintained a close connection with the UTsK, a body in whose formation it had played a key role. Excluding Volodymyr Kubijovyč, many of the UTsK leaders and a significant number of its cultural and organizational cadres were OUN members. The UTsK maintained an ostensibly neutral position on the split within the OUN between the Bandera and Melnyk factions, although tacitly it supported the latter. With the outbreak of German-Soviet hostilities a large number of the OUN activists who had been working with the UTsK joined OUN expeditionary groups. At the same time the UTsK declined to join the Ukrainian National Committee (Cracow), established by the OUN (Bandera faction) in late June 1941. It also refrained from involving itself in Galician affairs, although it did open the Work Bureau in Lviv (eventually with a branch in Rivne) to assist in the movement of refugees from the Generalgouvernement back to Galicia. After the annexation of Galicia by the Generalgouvernement the UTsK did not agree with German demands that it expand its activities into Galicia, because of the political characteristics of that territory. In September 1941 the Germans established the Ukrainian Regional Committee (UKK) to oversee the Distrikt Galizien, with statutes similar to those of the UTsK. In its jurisdiction the Ukrainian okruha committees (UOKs) performed the same function as the Ukrainian relief committees (UDKs). Kost K. Pankivsky was the head of the UKK. In February 1942 the Germans dissolved the Ukrainian Regional Committee and ordered the UTsK to expand its activities into Galicia. In March 1942 the Lviv executive branch of the UTsK began operations under Kost K. Pankivsky, who then became the UTsK's deputy leader. The cultural and youth departments were transferred to Lviv. The UTsK's jurisdiction in Galicia was fairly narrow. Ukrainians assumed control over the lower administration, the commissioners of education, the lower courts, and the auxiliary police (see Ukrainian Auxiliary Police). That situation, however, did not prevent abuses by the German authorities, which the UTsK reported to Governor Otto von Wächter, Governor-General Hans Frank, and the Gestapo chief in Berlin, H. Müller. Another aspect of German-Ukrainian co-operation was the creation, through the efforts of Wächter, of the Division Galizien. The Military Board of the Division Galizien (the division's civilian advisory council) worked with the UTsK in this area. The Germans agreed to limited Ukrainian involvement in the administration of Galicia, but both internal and external factors made Ukrainian participation difficult. In order to protect the civilian population the UTsK urged Ukrainians not to provoke the Germans and called for an end to revolutionary military resistance. At the request of the UTsK the Ukrainian Catholic hierarch (Andrei Sheptytsky) issued a proclamation to that effect. The capture of eastern Galicia by the Soviet Army in the spring of 1944 resulted in the partial evacuation of the UTsK and its workers to the western reaches of the Generalgouvernement; the central bureau continued to operate out of Cracow. A skeleton staff headed by Kost K. Pankivsky continued to work in Lviv. The Soviet advance of the summer and fall into Galicia and the capture of Lviv resulted in further evacuations of people via Cracow to Germany. Temporary accommodations were found for nearly 10,000 people in Slovakia. In early 1945 there were 300,000 to 400,000 Ukrainians in Germany who required the legal and social services the UTsK could provide. 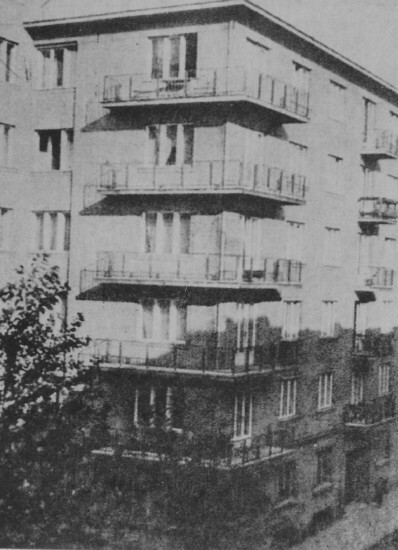 Through an agreement with the Generalgouvernement administration a UTsK bureau headed by Pankivsky was opened in Lüben (now Lubin) in Lower Silesia. The Cracow bureau was reduced, and the Berlin mission was expanded. The Vienna bureau was headed by Yurii Poliansky. The Ukrainske Vydavnytstvo (Cracow) and the editorial office of Krakivs’ki visti were also moved to Vienna. 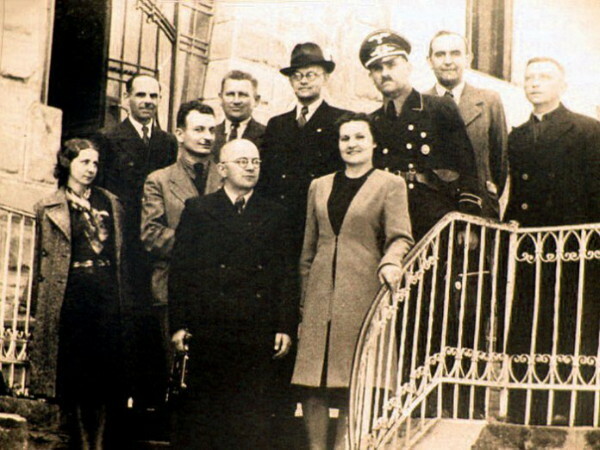 To assist Ukrainian workers and refugees approximately 20 local centers were set up by the UTsK in various German cities, and a conference of their directors was convened by the UTsK in Weimar in March 1945. When the Ukrainian National Committee (UNK) was set up under the leadership of General Pavlo Shandruk, Volodymyr Kubijovyč, as the head of the UTsK, became its deputy leader, and the UTsK local centers became the primary network of the UNK. After the Allied occupation of Germany Kubijovyč dissolved the UTsK on 17 April 1945 in Aufkirchen (in southern Bavaria) and handed its assets over to Vasyl Mudry's civic committee, which formed the basis for the Central Representation of the Ukrainian Emigration in Germany. Activity. From July 1940 until the outbreak of German-Soviet hostilities in June 1941 the UTsK leadership concerned itself mainly with reviving Ukrainian life in the territories that had been under Polish control. In virtually every village with a Ukrainian population, a Ukrainian school and a co-operative (see Co-operative movement) were established. A Ukrainian educational society (UOT) (which functioned much as a Prosvita society) could be found in 80 percent of these villages, and approximately 50 percent had youth groups and nursery schools. Much of this educational work was conducted by refugees from Galicia. In approximately 70 percent of the villages a ‘man of trust’ could be found. The most active Ukrainian centers in the Generalgouvernement were Kholm, Jarosław, Peremyshl, Sianik, Krynytsia (Krynica), and Cracow. Social services were by far the most important UTsK function and consisted of public health care as well as assistance to children, the sick, invalids, students, and Ukrainian prisoners of war. Dealing with these issues was made even more difficult by the constant interference of the German authorities. Food supplies were distributed by the UDK-UOK network, which received additional rations for community kitchens, student residences, and rest homes for children and youths as well as for civil servants and teachers. In mountainous regions seasonal kitchens were set up to deal with food shortages in the spring. In late 1943 there were 1,366 Ukrainian kitchens, which fed nearly 100,000 people. The UTsK was particularly successful in providing aid to victims of a flood in the Subcarpathian region in 1941: in the spring of 1942 it saved approximately 30,000 children from starvation by resettling them with peasant families in Galician Podilia and Pokutia. The UTsK also cared for Ukrainian prisoners of war (POWs) captured during the German-Polish conflict. It arranged for the quick release of around 85,000 of them. Some returned to the Generalgouvernement; others remained as laborers in Germany. The fate of Ukrainians taken on the Soviet-German front was much worse. Only very few, mainly those from Galicia, were released. They were forced to return home by foot, and most of them were ill with typhus. The UTsK commissioner for POW affairs, Roman Danylevych, toured virtually all the prisoner of war camps on Ukrainian territory, but he was powerless to stem the implicit German policy of exterminating Slavic POWs. The UTsK could do nothing for the staggering numbers of prisoners who died of disease, starvation, and exposure or were taken to concentration camps in Germany. The UTsK assisted in resettling approximately 10,000 Ukrainians who took advantage of the Volksdeutsche provisions of the German-Soviet accord in camps (Umsiedlungslager) in Germany in 1939–40. The UTsK secured administrative positions for many people within the Generalgouvernement civil service or in other state institutions. Among them were a few Orthodox clergymen from Bukovyna, who assisted in the Ukrainization of the Orthodox church. The UTsK also managed to resettle nearly 600 families in the Kholm region after they had been evacuated to Germany. When the Germans set up artillery ranges in the Lviv region in 1943, they displaced several thousand of the local rural population. The UTsK, in concert with local Ukrainian okruha committees, helped resettle those displaced people in other areas. The UTsK helped Ukrainian laborers in Germany through Ukrainian organizations there. Its Berlin mission issued certificates of nationality to workers from the Generalgouvernement. The UTsK petitioned the German authorities concerning political prisoners, to whom it sent care packages. It also secured compensation for Ukrainian invalids of the German-Polish War and the Ukrainian struggle for independence (1917–20). The public health department of the UTsK was directed by Vasyl Karkhut and later by Roman Osinchuk. It worked with the Labor Alliance of the Medical-Sanitation Service to deploy medical personnel, establish medical clinics and disinfection centers, train auxiliary medical personnel, and open four rest resorts. In education the UTsK was fairly limited because under Nazi rule all schools were state-run. The UTsK co-operated with the German authorities in forming new schools, finding teachers, and establishing curricula. The UTsK's education department organized training for those not qualified to teach in vocational schools and the retraining of teachers from gymnasiums. It also organized a preschool education system and oversaw pupil residences (131 in 1943–4, which housed 7,000 pupils). Funds for these institutions were taken from the social services treasury. The department was aided by the Ukrainian Teachers' Labor Alliance. The Ukrainian Students' Aid Commission (KoDUS), funded by the social services treasury and private donations, was established in 1940. It issued 730 scholarships (valued at 1,350,000 zloty) in 1943, subsidized a student cafeteria in Lviv, and maintained an assistance fund for Ukrainian students. The Labor Alliance of Ukrainian Students was the main Ukrainian student body in the Generalgouvernement. The cultural department of the UTsK oversaw extramural education. In the fall of 1939 the Prosvita society, the Kachkovsky Society, and the Ridna Khata society (in Podlachia and the Kholm region) were revived throughout the Generalgouvernement. On 16–17 March 1940 the First Cultural-Educational Congress was held in Cracow. In July 1940 Ukrainian educational societies (UOTs) began to function largely independently of one another but were overseen by the UTsK cultural department and maintained a liaison with local Ukrainian relief committees (UDKs). In March 1941 there were 808 UOTs with 46,000 members. The UTsK cultural department issued guidelines for the UOTs, prepared educational materials for them, published the monthly Dosvitni vohni, assisted in the assembling of libraries, and organized courses for UDK cultural officials. After Germany took control of Galicia from the Soviet Union all branches and reading rooms of the Prosvita society were reopened. The UTsK cultural department also oversaw the work of the Institute of Public Education (INO, headed by Stepan Volynets) and the Institute of Folk Art (INT, headed by S. Saprun). The INO aimed to train field workers and to provide them with instructional materials. The INT was divided into three virtually independent sections, music, theater, and folk arts. It oversaw 780 choirs and organized 10 conducting classes. It organized a festival of Ukrainian song in Lviv on 8 July 1943, in which over 1,200 singers participated. Art associations came under the umbrella of the Literary-Artistic Club. They included associations of painters, writers, journalists, musicians, actors, photographers, and scholars. A women's section, headed by M. Biliakova and M. Zaiachkivska, largely continued the work of the Union of Ukrainian Women. On 2–3 March 1942 the first congress of deputies of the women's groups of the Generalgouvernement took place in Lviv. The women's organizations dealt mainly with social services. The UTsK also tried to stimulate academic activity. There were some difficulties in this area. An Institute of Ukrainian Studies was planned to open in Cracow in 1941, but the plan was halted by the German-Soviet War. A Shevchenko Institute was to replace the banned Shevchenko Scientific Society, but it too was proscribed by Berlin. Nevertheless, the Labor Alliance of Academic Workers was established, the Ukrainske Vydavnytstvo (Cracow) publishing house remained active, and educational and vocational courses were taught. The UTsK also assisted Ukrainian academic institutions (such as the Ukrainian Free University) through the separate Academic Fund, headed by Vasyl Simovych. The youth department of the UTsK organized physical-education and sports clubs. Youth groups were divided according to age: 7 to 14, 14 to 18, and 18 to 24. In July 1941 the Ukrainian educational societies oversaw 52 school youth groups, 28 teen groups, 18 sports associations, and 46 fire brigades. The youth department organized camps, courses for cultural instructors, and jamborees (1,200 youths participated in one held in Kholm in 1941). Other youth organizations under the UTsK included the Ukrainian Youth Educational Societies (VSUM), which were similar to the scoutlike Plast Ukrainian Youth Association. In 1944 they had over 2,500 members, in 60 groups. The youth department organized two Galician youth congresses in 1943 and set up a number of rest and instructional camps. Leading VSUM figures included R. Olesnytsky and Kekyliia Paliiv. When the German authorities established compulsory construction service (Baudienst), the UTsK secured the right to form a separate Ukrainian Service to the Fatherland, headed by M. Rusnak. The UTsK's economic activity was marginal owing to wartime conditions. During its existence, however, some co-operatives were reopened, and new ones were established. After considerable difficulties Ukrainian county associations and the so-called Society of Patrons of Ukrainian Co-operation, headed by Yuliian Pavlykovsky, were set up. Co-operatives were kept under German control, however. The UTsK economic department called a congress of merchants and craftsmen and created the requisite labor alliances. The UTsK was financed by a variety of means. The primary source was a budgetary allotment given by the Generalgouvernement, earmarked mainly for social services but also covering administrative costs. Significant contributions were also made through regular collections among Ukrainian citizens. Material assistance (food, clothing, medication) also arrived from the International Red Cross in Geneva, with which the UTsK was in constant contact. The deputy head of the financial department in Lviv was Volodymyr Pushkar. The UTsK existed for over five years as the only Ukrainian social and community force during the Second World War that concerned itself with the vital interests of the Ukrainian people. For Ukrainians its activity was particularly significant in that it made possible the restoration of some national features to institutions that until then had been increasingly Polonized. These gains were made in spite of limitations imposed by the Nazi regime, such as the forbidding of all contact between the UTsK and Ukrainians in the Reichskommissariat Ukraine, Romania, and other territories. A referral to this page is found in 36 entries.